Located on the south-western shoreline of the island of Cyprus, the town of Paphos is a particularly beautiful spot. With a population of almost 50,000 inhabitants, Paphos is comprised of two main regions, the town of Paphos itself, and also the main coastal resort area. 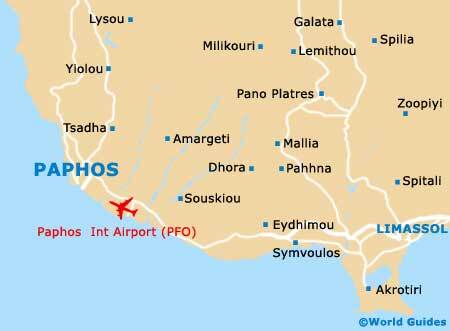 Standing in the city's eastern suburbs, the Paphos International Airport (PFO) serves in excess of 1.5 million travellers each year. 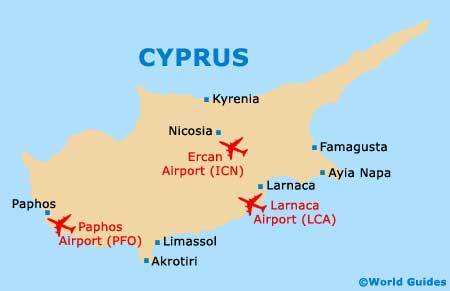 The airport is also close to Coral Bay and also near to Limassol. A popular spot for sun lovers, the coastline edging the Paphos area boasts an array of water sports and an important harbour. The beach around Coral Bay is especially notable and sunny, with plenty of nearby facilities and fine sand. Also worth considering, the Agios Georgios beach is close to the harbour bay and is a great place for a stroll, although it is a fairly stony stretch. Nearby, the beaches around Lara Bay are amongst the best that Cyprus has to offer and are particularly famous for their seasonal nesting turtles. Other highlights around the town include the historic Tombs of the Kings, which features stone pillars and walls covered in painted frescoes.